Homo sapiens reigns as the lone species of human on Earth, but this was not always the case. Other species of hominid, contemporary to ours yet far older than ours, thrived around the world. With the spread of modern humans, contact with the other species was inevitable. Only one species remains. What happened? What would an observer of our species, sent from a distant civilization from across the galaxy, make of the rising conflict? 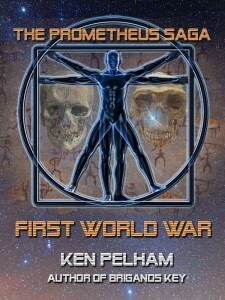 This story is an installment in THE PROMETHEUS SAGA, a cutting-edge, online anthology by twelve authors, each with a different perspective on human history. FIRST WORLD WAR is available from Amazon. Ken Pelham lives and writes in Maitland, Florida. His thriller, BRIGANDS KEY, won first place in the Florida Writers Association’s Royal Palm Literary Awards and was published in hardcover in 2012 by Cengage/Five Star Mystery. The ebook edition was released in 2013.